An awning window is hinged at the top and opens outward. The glass protects the opening like an awning, enabling ventilation even during rainy weather. Awning windows are ideal accents above or below picture windows, giving them a place in nearly any style of home. Awning windows are often used for basements because they can be placed high on the wall to let in both light and air. 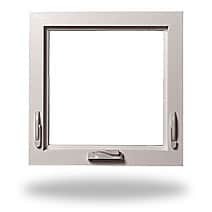 Awning windows generally are opened with a hand crank. Screens are on the inside of the window, where they’re more protected from the elements.